Authenticity resonates throughout the urbanizing world. As cities’ commercial corridors and downtowns start to look increasingly the same, and gentrification displaces many original neighborhood residents, we are left with a sense that our cities are becoming "hollowed out," bereft of the multi-faceted connections that once rooted us to our communities. And yet, in a world where change is unrelenting, people long for authentic places. This book examines the reasons for and responses to this longing, considering the role of community development in addressing community and neighbourhood authenticity. 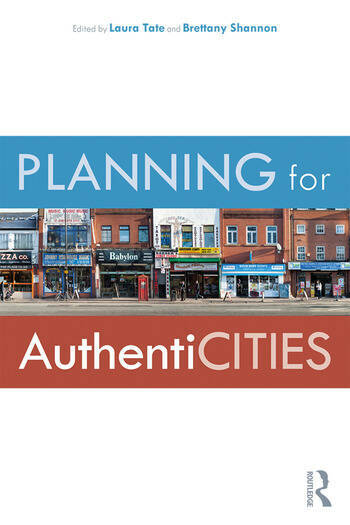 A key concept underscoring planning’s inherent challenges is the notion of authentic community, ranging from more holistic, and yet highly market-sensitive conceptions of authentic community to appreciating how authenticity helps form and reinforce individual identity. Typically, developers emphasize spaces’ monetary exchange value, while residents emphasize neighbourhoods’ use value—including how those spaces enrich local community tradition and life. Where exchange value predominates, authenticity is increasingly implicated in gentrification, taking us further from what initially made communities authentic. The hunger for authenticity grows, in spite and because of its ambiguities. This edited collection seeks to explore such dynamics, asking alternately, "How does the definition of ‘authenticity’ shift in different social, political, and economic contexts?" And, "Can planning promote authenticity? If so, how and under what conditions?" It includes healthy scepticism regarding the concept, along with proposals for promoting its democratic, inclusive expression in neighbourhoods and communities. Utilizing comical mascots (yuru-kyara) to create city authenticity? Laura Tate, PhD (University of British Columbia), is an urban planning scholar, lecturer and consultant. Laura has an extensive practice background in city planning and public health. She lives in Victoria, British Columbia, and has most recently held the position of Visiting Lecturer at the California Polytechnic State University. Brettany Shannon, PhD in Urban Planning and Development (University of Southern California), studies how media arts and digital communications intersect with urban and social placemaking. As the USC Bedrosian Center for Governance Scholar-in-Residence, she continues her research in the interview-based podcast, Los Angeles Hashtags Itself.